Absolutely breathtaking sea views from all rooms! Patio Apartment "Devon" is a spacious, deluxe two bedroom duplex apartment set in a superb location on the hillside overlooking the Old Town of Kalkan with stunning panoramic views of Kalkan Bay and the islands. The enchanting town with its cobbled back streets and very picturesque harbour is only a 10 minute downhill walk, so whilst the apartment is in a wonderfully tranquil location it is close to all amenities. The apartment occupies the 2nd and top floor and is one of only four luxury apartments sharing the infinity pool, the beautifully landscaped gardens and delightful pergola seating area to the side. The apartment has a newly furnished private roof terrace with a beautiful pergola providing welcome shade. There is also a stylish outdoor dining suite on the balcony by the living room. The apartment is cleaned on a weekly basis. A caretaker is on site 24 hours a day to provide assistance. All rooms are air-conditioned. I live in East Sussex with my partner Mark, my daughter and our 2 cats. I now work in Eastbourne for a wholesale company but spent many years in TV advertising and interior design. Mark has run his own hair and beauty supplies business in Brighton for over 20 years. We first discovered the magic of Kalkan in 2007, purely by accident (funnily enough on a search on Owners Direct). We always said we would never visit the same place twice but Kalkan is just so charming and pretty that we totally fell in love with it and have been coming back ever since. We have since made friends with both locals and other families who own property here. Buying this apartment in 2011 has been an absolute 'no brainer'. If you visit Kalkan I can guarantee you will not be disappointed! We bought Patio Apartment 4 in October 2011 from the previous owners John and Clare after seeing it in the August 2011 and being completely blown away. We’ve stayed in various locations around Kalkan over the years but without doubt the apartment has the 'wow' factor and we would challenge you not to be bowled over by the spectacular views from the apartment across the bay, which are, in our opinion unsurpassed. John and Clare had great success in renting out the apartment when they owned it, so whilst we intend to use the apartment regularly ourselves each year we are delighted to share the experience. Kalkan has an enchanting ambiance that will slowly but surely seduce you into the Turkish way of life. Sleeps 4 (2 Bedrooms) - Absolutely breathtaking sea views from all rooms! This spacious, deluxe two bedroom duplex apartment is set in a superb location on the hillside overlooking the Old Town of Kalkan with stunning panoramic views of Kalkan Bay and the islands. The enchanting town with its cobbled back streets and very picturesque harbour is only a 10 minute downhill walk, so whilst the apartment is in a wonderfully tranquil location it is close to all amenities. The apartment occupies the 2nd and top floor and is one of only four luxury apartments sharing the infinity pool, the beautifully landscaped gardens and delightful pergola seating area to the side. The apartment is cleaned on a weekly basis. A caretaker is on site 24 hours a day to meet/greet and to provide assistance. Both bathrooms are stylish and contemporary. En-suite to Master Bedroom with Walk in Shower & WC, stunning views across bay. Shower Room (2nd floor – across hall from twin bedroom) - Spacious Shower & WC. Open plan living area with L shaped sofa. Floor to ceiling patio doors leading onto large balcony to the left with stylish dining suite. Juliet balcony to the front. Magnificent sea views. Flatscreen TV for use with the DVD player, CD/Ipod player. Fully equipped modern open plan kitchen with marble work tops, breakfast bar with bar stools, oven/hob, large fridge freezer and dishwasher. Shared with only 3 other apartments. 4 sunloungers per apartment. Outside: The apartment is one of only four luxury apartments sharing a large sunbathing area with comfortable sun loungers and parasols, private infinity pool (filled from the beginning of May to end of October & cleaned every day) and a comfortable pergola seating area where guests can relax out of the sun. The apartment complex sits in beautifully maintained landscaped gardens. The pool is deep but has a small shallow area by the pergola. It is not supervised so guests with young children must take care. Utility Room: Utility room upstairs - With a washing machine and a small balcony area at the rear of the apartment for drying clothes. An iron/ironing board and clothes horse are provided. Cleaning / Towels / Linen / Maid service: Bedlinen, bath towels and beach towels are all provided. A weekly cleaning and linen change is provided. Additional cleaning and linen change available at extra cost. Optional Welcome Pack on arrival (£20). Other: Absolutely stunning private roof terrace with shade provided by a pergola, furnished with stylish sofa, chairs and sun loungers. Perfect for an early evening drink or a welcome bit of shade during the day. There is a safe in the Master bedroom. We really couldn’t fault this apartment. It was light and spacious, tastefully decorated and maintained to a high standard. Kitchen was well equipped. Views of Kalkan were absolutely stunning from both the balconies , particularly from the top one with its lovely comfortable seating and its sun beds. Opening the curtains first thing in the morning and looking out over Kalkan to the sea will be one of our lasting memories. Will return. immaculate, beautifully furnished and luxurious are just a few words to describe this apartment. The master bedroom patio was a fantastic bonus with a jaw dropping view to match. 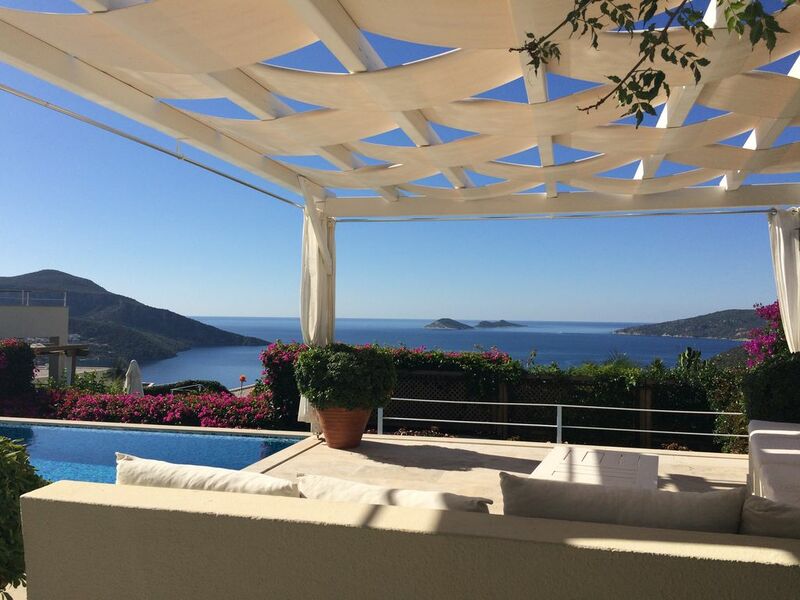 All windows have amazing outlooks onto the beautiful Kalkan bay. We couldn't fault anything. Aircon was excellent and wi fi strong. The pool area is tranquil and well kept with plenty sun beds. It was one of our best holidays in years!! What can we say, we had another two weeks wonderful holiday in what we feel is now our second home at this lovely apartment. Lorraine we can't thank you enough for having us back so many times and every year it just keeps getting better. The apartment is beautiful with splendid views of the harbour and town, the pool area is quite and relaxing and the walk into town is only 5 minutes away. Basically you would have to go a long way to find something as nice and quite as "Apartment Devon". We highly recommend you try this little gem of an apartment and when you have been once you will be booking to come again. Thank you as always for your wonderful reviews. You've been a fabulous guest over the years. Fantastic Appartment in a fantastic resort! Once again a fabulous Holliday, 2nd time here and will be back next year! There is nothing not to like about this property and it's location and fantast views. We took friends for there first time and they are now re booking to go back for a month. Fantastic restaurants are in abundance. Great customer service and a well maintained and serviced property. Would recommend to anyone! Thank you so much for choosing Patio Devon and for your kind review. See you next year! Patio Devon is an amazing property!! Beautifully appointed, incredibly comfortable and amazing setting - patio Devon has one of the best locations in Kalkan. The views are incredible - waking daily to a clear view of snake & mouse island from the foot of our bed was an absolute treat. Lorraine was a dream to deal with and so helpful. The apt had everything we could possibly need and was perfect for a family of four with main bedroom upstairs with stunning terrace with sofa seating perfect anytime. Second twin bedroom off of main living area - air con was a god send - kitchen had everything as a few evenings we ate in so we could enjoy the sun disappearing behind the mountains and chill by pool or terrace. Pool perfect / incredible view and shade area and brollies much needed in August! Short walk (10 mins) to town. Very steep but taxi back 7Tl was best return. Market Thursday great. Turkish people everywhere so lovely and friendly. Super restaurants - never had a bad meal - faves: fenner cafe / belkins (love cushion terrace) Sade, waipano, Gironde, hunkar (great delivery service). Did beautiful boat trip with captain Osman (highly recommend) - fave beach clubs Yali and indigo. Beware of Kalkan beach club as area around slide very sharp and daughter badly cut toe (town chemist was a dream patching that up!). All in all an amazing holiday in a fabulous property. Sad to leave but We will be back. Julie and Ian. Thank you for your exceptional review. You are very kind. We never ever tire of the spectacular views - a proper time waster!! We would love to welcome you back soon. Thank you so much for choosing Patio Devon. This was our second visit to Kalkan but our first to Patio Devon. Kalkan was even more beautiful than last October (the fabulous weather helped with that) and the Apartment couldn't have been better. The morning cuppa on the rooftop terrace while the kids were still asleep was fantastic. The shared pool is beautiful and the view from it magical!! We will most definitely be back as have all fallen in love with the area! The steep walk down to dinner at night was quick and a taxi back up after a little vino was only a couple of pounds....bliss!! So pleased you had such a fantastic time and thank you so much for the brilliant review. We look forward to welcoming you back, should you choose to return to us. Couldn't agree more about Kalkan - very difficult to stay away!! Kalkan has a small blue flag pebble beach, suitable for all ages (10-12 minutes walk from the apartment) with cafes and facilities nearby including sun lounger hire. Several beach clubs in the Kalkan area offer water sports. Most clubs provide free taxi/water taxi transfers. Patara, a beautiful, 12km long sandy beach (home to endangered loggerhead turtles) is some 20 minutes away by local dolmus bus, taxi or guided tour. Kapatus Beach, between Kalkan and Kas is a 15 minute taxi drive away. The closest airport to Kalkan is Dalaman. There are numerous flights from most UK airports including the London airports, Manchester, Aberdeen, Edinburgh and Glasgow. The transfer time from the airport is around 90 minutes. Taxis are approx £130 return for up to 3 people and £140 return for up to 8. Taxi transfers can be easily arranged for you via the highly reputable Ege Rentals Kalkan (based in the village). Kas (25 mins) Fethiye (1 hour) - picturesque harbours/weekly markets. Trips not to miss – Kekova (Sunken City), Saklikent Gorge, Patara Beach. Archaeological sites to visit - Xanthos and Letoon. We highly recommend Club Lycia Travel in the town to organise trips, car hire, airport transfers. Boat trips leave the harbour daily. Also available: diving, horse riding, paragliding, canoeing up the Dalaman river. Also well worth a visit: Islamlar -renowned for its trout farms and rambling houses. Kalkan is quite magical and widely regarded as one of the most sophisticated and picturesque coastal resorts in Turkey. It is renowned for its combination of wonderfully cosmopolitan and traditional restaurants - which now number in excess of 100! Enchanting little shops, open until late into the summer evenings and bars dotted along the pretty harbour-front and cobbled back streets will guarantee you a truly memorable stay. Kalkan is very proud of its distinctive Ottoman Greek architecture. In the evening when the town truly comes alive the cobbled back streets become the domain of the pedestrians and so are incredibly safe. The people are warm, friendly and helpful without being intrusive. Most of Kalkan’s restaurants are either situated on roof terraces or around the beautiful harbour allowing you to enjoy awesome night views as you delight in the excellent high standard of food served throughout. The extensive menus offer first class food at exceptional value. The town has several supermarkets, a doctors’ surgery, dentist, pharmacy and a small hospital. Several luxury hotels have spas where you can 'enjoy' a Turkish bath. There are several banks, cash machines and a post office. Currency is also offered at very competitive exchange rates in various shops in town. The currency is the Turkish Lira but pounds sterling are readily accepted. Taxis from the airport are usually paid for in pounds. There is a weekly local market. You can find almost anything in Kalkan, from carpets to Turkish Delight and the traditional blue-coloured glass 'evil eye' for warding off evil spirits. Gold and silver jewellery is a great buy as it is sold by its weight. Intricately-decorated ceramics, hand-blown glass, hand-carved Meerschaum pipes, backgammon sets inlaid with mother-of-pearl, high quality leather goods (for excellent prices), beautiful Turkish kilims (hand-woven rugs) and carpets (traditional knotted rugs are just some of the items on offer. Booking Notes: A 25% non returnable deposit is required at the time of booking. The remainder should be paid 9 weeks prior to departure. A separate refundable breakage deposit of £200 is also required 9 weeks prior to departure, which will be returned 2 weeks after the end of your holiday. Payments are to be made by bank transfer. Please note, any international bank charges (usually £9 per transfer) will be passed back to you. Rentals of 1 month or longer outside of the normal season are available. Changeover Day: Preferred changeover is Monday but where possible may be flexible. Guests should check in after 4pm and check out at 12 noon. This may be flexible but early arrivals or late stays will count as an extra night unless pre agreed. Notes on prices: Early arrivals or late stays will count as an extra night unless pre agreed and will incur an additional charge of one day. We are very happy to consider longer rentals outside of the normal season. If this is of interest please contact us for rates/discounts.